Its almost time for the Super Bowl….and that means its time for all kinds of great food recipes, especially food that is snack sized. So I have a special wing recipe from John Rivers of 4 Rivers Smokehouse. 1. Light a smoker using hickory wood and allow temperature to settle at 305˚F. 2. Combine sugar, chili powder, and 4R All-Purpose Rub in a large bowl. Sprinkle over wings to thoroughly coat. 3. Smoke at 305˚F for 45 minutes. 4. Just before serving, light a gas grill and heat to medium high. 5. Toss wings in BBQ sauce and “flash” on grill to allow sauce to caramelize, 3 minutes on each side. Flip only once. 6. Serve hot with ranch or blue cheese dipping sauce. 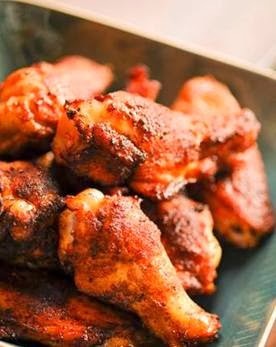 "The biggest difference between these wings and traditional fried wings is that the smoke and the rub drive the flavor, rather than depending on the sauce for flavor. In addition to producing a plumper and moister wing, this method is better for you. I consider this our healthy alternative at the smokehouse"…John Rivers.